Of the softer woods, the birches make the best fuel; black birch in particular makes a fine camp fire, and it is one of the few woods that burns well when green. The dry bark of the hemlock makes a quick and hot fire, and white birch takes fire quickly even though moist. Driftwood is good to start a fire with, and dry pine knots - the limb stubs of a dead pine tree - are famous kindlers. Green wood will, of course, burn better in winter when the sap is dormant, and trees found on high ground make better fuel than those growing in moist bottom lands, Hard woods are more plentiful on high ground, while the softer woods are found in abundance along the margins of streams. For cooking the noonday meal a small fire will suffice to boil the pot and furnish the heat sufficient to make a fry. Simply drive a forked stick in the ground and lay a green stick in the fork with the opposite end on the ground with a rock laid on it to keep it down, and hang the pot on the projecting stub left for this purpose. A long stick with projecting stubs, planted in the ground to slant over the fire at an angle, will serve as well. Let the pot hang about 2 ft. from the ground, collect an armful of dry twigs and plenty of larger kindling sticks. Now shave three or four of the larger sticks and leave the shavings on the ends, stand them up beneath the pot, tripod fashion, and place the smaller sticks around them to build a miniature wigwam. While the pot is boiling get a couple of bed chunks, or andirons, 4 or 5 in. in diameter, set and level these on each side of the fire, and put the frying pan on them. When the pot has boiled there will be a nice bed of coals for frying that will not smoke the meal. 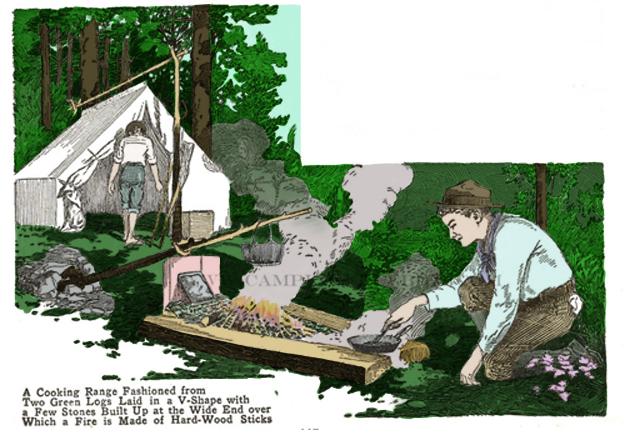 When the woodsman makes "one-night stands," he will invariably build the fire and start the kettle boiling while he or a companion stakes the tent, and as soon as the meal is prepared, a pot of water is started boiling for dish washing. For roasting and baking with the reflector, a rather high fire is needed and a few sticks, a yard or more long, resting upright against a backlog or rock, will throw the heat forward. When glowing coals are wanted one can take them from the camp fire, or split uniform billets of green, or dead, wood about 2 in. thick and pile them in the form of a hollow square, or crib. The fire is built in the center of the crib and more parallel sticks are laid on top until it is a foot or more higher. The crib will act as a chimney, and a roaring fire will result, which upon burning down will give a glowing mass of coals. 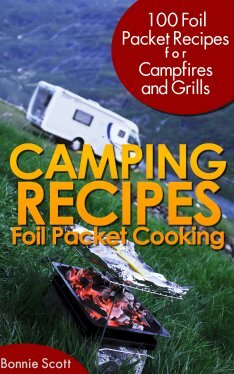 Camp cookery implies the preparation of the more simple and nutritious foods, and in making up a list it is well to include only the more staple food-stuffs, which are known to have these qualities. 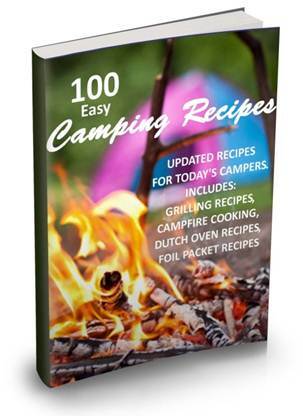 Personal ideas are certain to differ greatly, but our camping checklist may be depended on and will serve as a guide.